AUSTIN, Texas – HARMAN’s Studer will be showcasing a 22-fader version its class-leading Vista 1 digital console, as well as its compact-yet-powerful OnAir 1500 radio console, at the Texas Association of Broadcasters (TAB) 62nd Annual Convention & Trade Show. The show will take place August 5-6 at the Renaissance Austin Hotel. The TAB Convention & Trade Show is the largest state broadcast meeting in the United States, featuring two days of management, engineering and sales programs, plus a trade show with industry vendors from around the country. Measuring just over 1 meter in width, the 22-fader Vista 1 is perfectly suited to small spaces such as those found in OB vans. For smaller vans where the audio console fits into the cab area, the Vista 1 provides a comprehensive solution requiring no additional racks, including integral I/O, DSP and surround sound management including up and down-mixing. The low weight advantages of the desk are immediately obvious. The Vista 1 uses the same patented user interface as the rest of the Vista family, so existing Vista users will be immediately familiar with all the functionality of the Vistonics™ and FaderGlow™ user interfaces plus features such as true broadcast monitoring, talkback, red light control, GPIO, N-x (Mix Minus) busses, snapshot automation and DAW control. 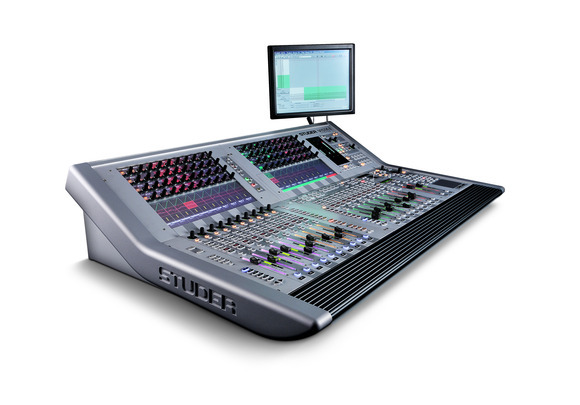 The Studer OnAir 1500 is a 12-channel, 6-fader console (expandable to 12 faders) that is ideal for studios needing an additional professional-grade fader unit and additional I/O or a compact and cost-effective mixing console for a production room or on-air studio. Integrated USB playback and record functions make the OnAir 1500 a very compact yet complete production unit and mixer. With simple point-to-point connectivity it can easily be moved around as a backup or secondary unit.